The purpose of this Article is to describe how the new Immigration Law Clinic at Southern New England School of Law has combined attention to the School's mission of educating students and expanding justice by serving the community with the broader goal of addressing the continuing educational needs of recent law school graduates. The Clinic not only offers direct legal services to clients but also trains and mentors recently graduated local attorneys, who offer both pro bono client representation as well as student supervision. Through the Immigration Law Clinic, these attorneys are trained in both immigration law and clinical supervision. This dual training has enhanced the Clinic as well as provided the South Coast area of Massachusetts with attorneys trained in the types of legal issues that plague lower-income immigrants. In addition, these attorneys, now acting as clinical supervisors, allow the Clinic to admit more students, thereby providing both clinical experience to greater number of students and legal assistance to greater numbers of immigrants. Originally published in the Clinical Law Review in 2005. 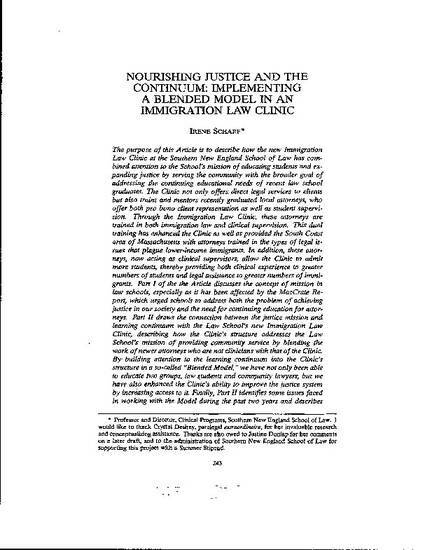 Irene Scharf, Nourishing Justice and the Continuum: Implementing a Blended Model in an Immigration Law Clinic, 12 Clinical L. Rev. 245 (2005).